Acting FBI Director Andrew McCabe is appearing before Congress in his new role Thursday, taking what was supposed to be fired FBI Director James Comey's place at a Senate Intelligence Committee hearing on worldwide threats. Other witnesses include Director of National Intelligence (DNI) Dan Coats, CIA Director Mike Pompeo, National Security Agency (NSA) Director Admiral Mike Rogers as well as the heads of other agencies. The hearing had been scheduled in advance of President Trump's decision fire to Comey as FBI director on Tuesday. Deputy Attorney General Rod Rosenstein was seen walking into a separate room used by the Senate Intelligence Committee. Chairman Burr announced that he and Warner had to step out for an "important" meeting that couldn't wait. McCabe said that he worked very closely with Comey at the FBI and worked for him running the bureau's Washington field office. "I can tell you that I hold Director Comey in the absolute highest regard," McCabe said. McCabe added that Comey "enjoyed broad support within the FBI and still does to this day," contradicting the White House's claim that Comey had lost the support of rank-and-file members of the FBI. Heinrich asked McCabe if the FBI has "adequate resources for existing investigations that the bureau is invested in. McCabe said that if he's referring to the Russia investigation, he said, "I believe we have the adequate resources to do it." CBS News reported on Wednesday that Comey requested more resources for the probe from the Justice Department last week. Sen. Martin Heinrich, D-New Mexico, asked McCabe when he last met with President Trump. 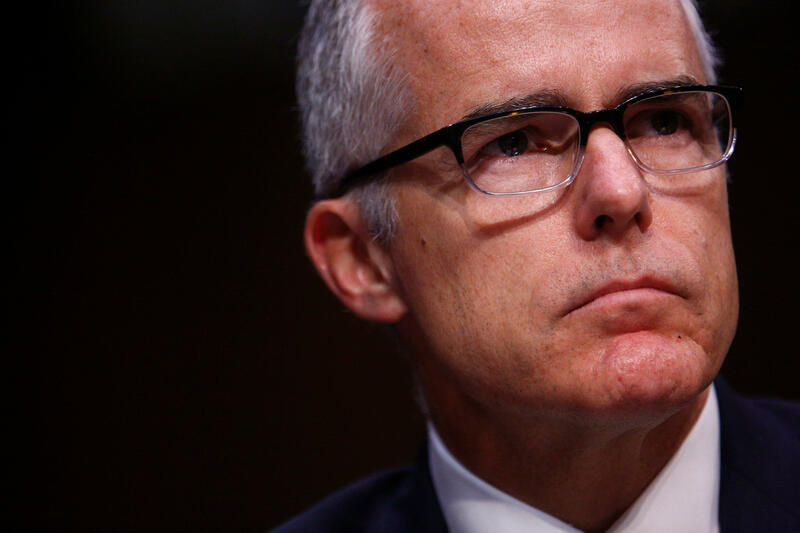 "I don't think I'm in a position to comment on that," McCabe initially said. "I have met with the president this week," he added. Asked if Russia did not come up during the meeting with the president, McCabe said, "That's correct. It did not." Wyden asked McCabe if he would refrain from providing updates on the Russian investigation to the White House. Sen. Ron Wyden, D-Oregon, said that one of the few key unanswered questions is why President Trump didn't fire Michael Flynn as national security adviser after Acting Attorney General Sally Yates warned the White House about Flynn being vulnerable to blackmail. Wyden asked Pompeo, the CIA director, if he knew about Yates' warning. "I don't have any comment on that," Pompeo said. " Wyden asked if he was aware of the concerns behind Yates' warning, but Pompeo suggested that he didn't understand how it posed a threat. Wyden said that the possibility of blackmail by an influential military official has real ramifications. "I wasn't paprt of any of those convernsations," said Pompeo, who said that the "CIA has kept Americans safe" and "will do that in the face of political challenges." Intel leaders warn of threat North Korea poses to U.S.
Sen. Dianne Feinstein, D-California, the former top Democrat on the panel, said that the "greatest threat" the U.S. currently faces is North Korea. She asked the witnesses if they could estimate when North Korea will have an ICBM capable of holding a nuclear warhead. They said they would save those details for a closed session with the senators. The director of the Defense Intelligence Agency, Lt. Gen. Vincent Stewart, said that the U.S. has not yet seen North Korea do a missile launch, with ICBM range, miniaturization and survival. "They're on that path and they're committed to doing that," Stewart said. The director of the National Geospatial-Intelligence Agency, Robert Cardillo, warned that North Korea is "in a race" and Kim Jong-Un is "pushing very hard on the accelerator." Feinstein that the American public should understand that the U.S. faces an "existential threat in the Pacific Ocean and we need to come to grips with it." Sen. Marco Rubio, R-Florida, asked McCabe if the dismissal of Comey impeded, interrupted, stopped or negatively impacted any investigation or any ongoing projects at the FBI. "As you know, senator, the work of the men and women of the FBI continues despite any changes in circumstance, any decision. There has been no effort to impede our investigation to date," McCabe said. McCabe reiterated that you "cannot stop" the men and women of the FBI from "doing the right thing" and upholding the Constitution. NSA Director Admiral Mike Rogers says that, "We are aware of some Russian activity directed against the French election process." Rogers said that the U.S. reached out to our French counterparts, but he said he wasn't in a position to look at the breadth of French infrastructure. Warner asked McCabe if he would commit, as long as he serves as acting FBI director, to informing the committee of any interference with the FBI's investigation on Russian and possible collusion with the Trump campaign. "I absolutely do," McCabe said. Warner also asked each of the witnesses testifying whether they believe that the January 2017 intelligence community assessment accurately characterized the extent of Russian activities to influence the 2016 election. All of the witnesses said, "Yes." Burr asked Acting FBI Director Andrew McCabe if he ever heard Comey tell President Trump that he was not the subject of an investigation. "I can't comment on any conversations the director may have had with the president," McCabe said. DNI Dan Coats is listing the range of threats facing the U.S. He mentioned North Korea's nuclear ambitions and their development of intercontinental ballistic missiles (ICBMs), though he said that a mobile ICBM has not yet been flight-tested. Coats said that the Syrian regime used the nerve agent sarin in early April against its own people in the largest chemical attack on the regime since August 2013. Coasts that that the worldwide threat of terrorism is geographically diverse and multi-faceted. He said that the Islamic State in Iraq and Syria (ISIS) is experiencing territorial losses in Iraq and Syria, but he warned that it will continue to pose an active terrorist threat to the U.S. due to its proven ability to direct attacks around the world. Ranking member Sen. Mark Warner, D-Virginia, said in his opening statement that it's hard to avoid the conclusion that Comey's firing was related to the Russian probe, and he said "that is truly unacceptable." "It is not impossible to ignore that one of the leaders of the intelligence community is not here with us today," he said, adding that Comey's firing Tuesday was a "shocking development." Warner said that Comey was leading an active counterintelligence investigation into any links between the Trump campaign and Russian officials and any coordination between the two to interfere with the 2016 election. He said originally, they were supposed to hear from Comey on Thursday and anticipated asking him a series of questions about his actions and the FBI's actions to look into Trump associates. Warner said that Trump's actions cost the panel the opportunity to get at the truth, but he vowed to get to the bottom of what happened. Chairman Richard Burr, R-North Carolina said that while many are hopeful the panel would focus Thursday on Russian intervention in the 2016 election, which he said is viewed as a "significant threat," the hearing will focus on the range of threats faced by the U.S..
Burr said that the committee will be holding a classified version of the hearing Thursday afternoon.